Sun reveals time, school teaches life. From 1942 to 1972 the school of Chiappera has been operating and open for the schoolchildren of the village. A writing ’OPERA PIA D.CALANDRA’ (charity of D. Calandra) was displayed on the main school. But who was actually this man, named Calandra, to whom the inhabitants of Chiappera dedicated their school? This story dates back to the 19th Century. Davide Calandra, inhabitant of Acceglio, was a man of great culture and humanitarian ideals, deeply convinced that the human and social development of a population were closely related to its education degree. Since he didn’t have a family he dedicated all his holdings to establish a foundation named ’Charity Institution for the Free Education of the Inhabitants of the Acceglio Municipality’. The forward-looking pioneer Calandra, who lived in an era of demographic expansion of the municipalities of the upper valleys, could not foresee the depopulation which would shortly have emptied those areas, especially after the second world war. That’s how the four schools, built thanks to the Calandra’s charity, had to close gradually for a lack in school students. Chiappera, because of its altitude (1600 m above sea level) and its distance from the administrative center was one of the first to close. 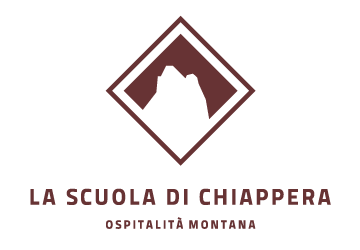 The current school owners were willing to bring its vocation back to life and decided to make it become an accommodation facility in order to enhance and promote the natural beauties of the valley of Chiappera, deeply sure of its touristic vocation.